The John Oxley, was build in 1927, at the Thistle Yard. One of a number of shipbuilding sites on the White Cart river in the Burgh of Paisley, Scotland. The Cart enters the River Clyde directly opposite the former Clydebank Shipyard where many of the world’s most famous liners were built. See Google Earth at coordinates 55 53 15.35N 4 24 23.76W for an aerial view. Other aerial images on this page are also derived from Google Earth. Click on any image to enlarge. The Ordnance Survey map of 1898 shows the Thistle Works. The Ordnance map coordinates equate with: 55.86522750N 4.42402620W. A side by side comparison of the 1898 map and an aerial image of today show the changes in the landscape. The John Oxley was launched on Wednesday, July 20, 1927, attended by the Hon John Huxham, Agent-General for Queensland. See newspaper article on her launch. The Thistle yard was opened by Campbell & Co in 1880. They built four or five ships before going bankrupt in 1881. The yard was reopened by James McArthur of Abbotsinch in 1882 and from then until 1900 turned out many coasters and small passenger steamers. Despite the death of the proprietor in 1891 and a serious fire in 1895, the business prospered and was sold as a going concern to Bow McLachlan & Co Ltd.
William Bow and John McLachlan had established the firm of Bow McLachlan & Co in 1872 at Abbotsinch, Renfrewshire. Initially they were manufacturers of steering gear and light marine engines. The business turned to shipbuilding following the acquisition of the Thistle Works, Paisley, Renfrewshire, in 1900. Their specialisation at this point was the manufacture of vessels supplied in kit form. ”William Bow’s father was an iron founder in New Sneddon Street appearing in the trade directories in 1851. William Bow and John McLachlan first appear in the directory of 1872 as engineers,millwrights, iron-founders and tool makers at the Thistle works , Bridge Street. By 1881 the Thistle Engine Works had moved to Abbotsinch, but it is not until 1902 that they describe themselves as shipbuilders. The last entry for the company is in 1931. The Paisley and Daily Gazette of 20 April 1927 carried the death notice of William Bow, about 2 months before the Launch of the John Oxley. The launch was attended by his son Joseph Hume Bow, joint managing director of Bow McLachlan & Co. Bow McLachlan & Co Ltd ran the yard until its closure. It has been suggested that they manufactured small ships at their 20-acre site at Abbotsinch prior to 1900, but there is no hard evidence for this. This is also borne out by the fact that they continued with McArthur’s numbering system. Their first ship was Yard No. 137 on taking over the shipyard. The John Oxley is Yard No. 464, as shown on this stamp from drawing No. 223. These drawings can be viewed via the Original 1927 Drawings page. William Bow was a benefactor of Paisley and district with gifts to Paisley College, assistance with public parks. He is remembered especially for his offer of £500 to the first airman to shoot down a German zeppelin over Britain in the First World War. The offer was honoured in 1916, and through this and other activities he became well known. This presumably smoothed the way for King George V’s to visit three Paisley shipyards in 1917 when he launched three ships within one hour! 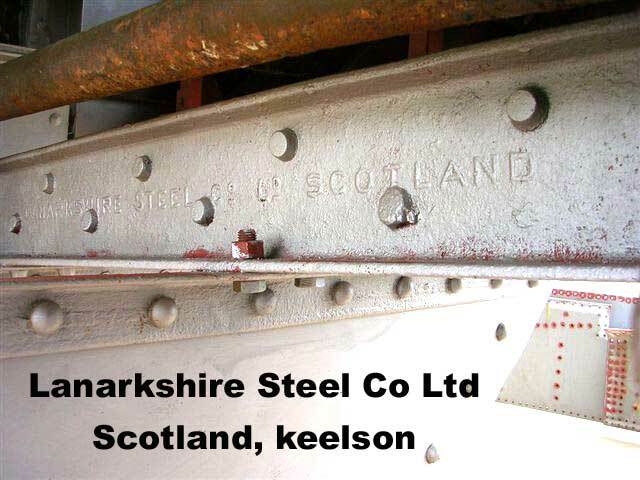 See also the visit of King George V to the Lanarkshire Steel Co Ltd.
Much of the structural steel used in the John Oxley came from Lanarkshire Steel Co Ltd. Their mark is embossed on the keelson and still visible. See also the Lanarkshire Steel Works history and the history on Scottish iron and steel making. Bow McLachlan & Co Ltd had a name as tug builders and continued to supply these interesting craft into the 1920s with two each for the competing Clyde towage companies of Clyde Shipping and Steel & Bennie. Many barges were built for overseas, often as knock down jobs. As the 1920s drew to a close many of the experienced senior staff had passed away, and with the managing director having other business commitments, the closure of the yard was accepted all round. The company Bow McLachlan & Co Ltd went into voluntary liquidation in 1932. National Shipbuilders Security Ltd, London, purchased the Thistle Works. The end of the River Cart shipbuilding is a matter for sadness and some regret. With the passing of these slightly rough and ready companies, the nation lost specialist skills and a body of men of independent mind. Such yards were excellent training grounds, as most apprentices, and certainly any young man lucky enough to be an assistant manager, were exposed to every aspect of the shipbuilding business. Today, Abbotsinch is the site of Glasgow airport. 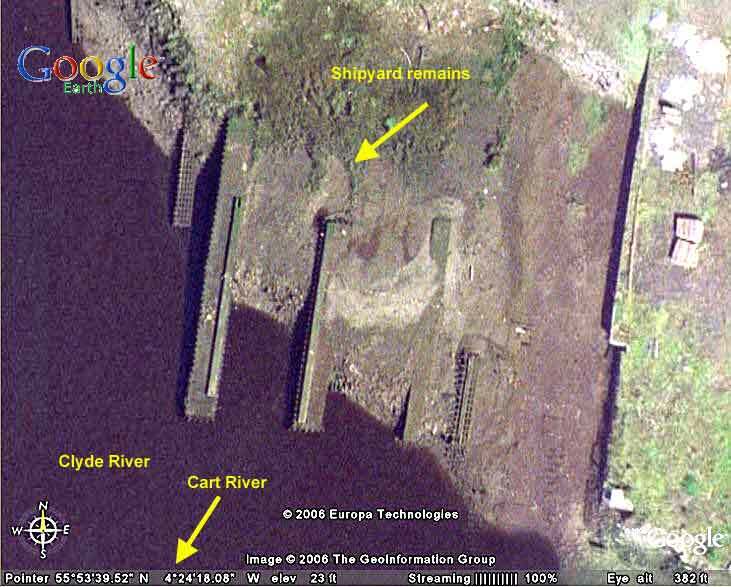 Other remnants of the ship building industry on the White Cart River are visible in the Google Earth images on the left. Incidentally, the Black Cart River joins the White Cart River just before the confluence with the Clyde River. One of the last vessels build by Bow McLachlan & Co Ltd is the paddle steamer tug John H. Amos Yard No. 497, see the Medway Maritime Trust.